When the heartbeat is abnormally fast or slow, or when it is irregular, the abnormality is referred to as an arrhythmia. A normal heart rate at rest is usually between 60 and 100 beats per minute. Heart rates slower than 60 beats per minute are called bradycardia. Heart rates faster than 100 beats per minute are called tachycardia. Some variation in heart rate is normal—for example, when the heart responds to exercise, to inactivity, or to other stimuli such as anger or pain. Only when the heart rate is unusually fast (tachycardia) or slow (bradycardia) or when the heart's electrical impulses travel in abnormal pathways is the heart rate considered abnormal. An arrhythmia may occur at unusual times and for no obvious reasons. This may signal an underlying cause of the abnormal heartbeat, such as coronary artery disease (see page 204). The heartbeat originates in the heart's internal pacemaker (sinoatrial node), which sends out electrical signals that tell the heart muscle when to contract (beat). The heart rate also is influenced by external nerve impulses and by levels of hormones circulating in the bloodstream. External nerve impulses that help regulate the heart rate come from the auto-nomic nervous system, which consists of the sympathetic and parasympathetic nervous systems. The sympathetic nervous system speeds up the heart rate, and the parasympathetic nervous system slows the heart rate. The sympathetic nervous system produces the hormones epinephrine and norepinephrine, which have a role in regulating heart rate and blood pressure. When something upsets the balance among these factors or interferes with the electrical signal from the sinoatrial node, an arrhythmia may result. In some cases, however, arrhythmias occur without any detectable underlying cause. Even a person with a life-threatening arrhythmia may not be aware of it because some arrhythmias, regardless of their significance, may cause no symptoms. Other, relatively harmless arrhythmias, however, may cause a variety of symptoms. Although the symptoms of an arrhythmia may be disturbing, it is important to understand that an arrhythmia may also be a symptom of an underlying disease or condition that usually is more serious than the arrhythmia itself. Possible symptoms of arrhythmias include palpitations (awareness of one's own heartbeat), light-headedness, dizziness, fainting, chest pain, and shortness of breath. If you have symptoms of a possible arrhythmia see your doctor. He or she will check your pulse and listen to your heart through a stethoscope to evaluate your heart rate. You may need to undergo additional testing to help the doctor make a diagnosis. Electrocardiography (ECG; an examination of the electrical activity of the heart) usually is used to diagnose an arrhythmia. However, when the abnormal heartbeats are intermittent, the ECG may not be able to detect them. In such cases the person may need to wear a Holter monitor for 24 hours. A Holter monitor is a portable ECG device that is worn around the neck or over the shoulder, with electrodes attached to certain areas of the chest. As the person goes about his or her daily routine, the device records the electrical activity of the heart on a special cassette tape. At the end of the 24-hour monitoring period, the physician analyzes the information on the tape. (People with severe arrhythmias are usually hospitalized for monitoring.) The doctor also may test your blood for a chemical imbalance or to determine if your thyroid gland is functioning properly. 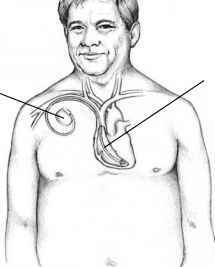 Chemical imbalances and thyroid problems can cause some arrhythmias. While mild arrhythmias may not require treatment, more serious arrhythmias or those that produce intolerable symptoms may be treated with a variety of medications, such as beta-blockers and calcium channel blockers. Other drugs that control an abnormal heartbeat by slowing transmission of the heart's electrical impulses also may be prescribed. You may need to try several drugs before your doctor finds the medication that works best for you. Electronic pacemakers also are often used to treat serious arrhythmias. A pacemaker is a battery-powered device that regulates the heartbeat with electrical impulses. Two types of pacemakers are available: temporary and permanent. A temporary pacemaker usually is inserted beneath the skin of the chest following a heart attack that has created a block of the heart's own electrical signal. The pacemaker produces electrical impulses that keep the heart beating at a normal rate. In most patients, the heart block usually corrects itself in a matter of days, and the temporary pacemaker is then removed. A permanent pacemaker is implanted surgically just beneath the skin of the chest. Usually it is used to regulate an abnormally slow heart rate. When the heart rate slows to below a certain number of beats per minute, or when the heart misses a beat, the pacemaker produces electrical impulses that restore the normal heart rate. If necessary, the pacemaker can produce electrical impulses at a continuous, fixed rate. Less commonly, pacemakers are used to regulate an abnormally fast heart rate. To implant a pacemaker, the surgeon numbs your chest with a local anesthetic and inserts a catheter (a thin, flexible tube) through a large vein (the subclavian vein) located just beneath the skin of your upper chest. He or she then threads one or more electrodes through the catheter and into one of the chambers of your heart. The electrodes, which will supply electrical impulses to your heart, are attached by fine wires to a small, battery-operated power source. The surgeon then creates a small pocket just beneath the skin of your chest below the collarbone, places the power source inside, and stitches the pocket closed. A pacemaker is implanted just beneath the skin and attached to the heart with wires.The device delivers an electrical impulse (at a fixed rate or whenever it is needed) to an electrode placed in one of the ventricles of the heart.The pacemaker switches on whenever the heart slows down or misses a beat. You will be hospitalized for a day or two after surgery. For at least 8 weeks after surgery, you will need to limit movement, particularly on the side where the pacemaker is implanted, to prevent the wires from becoming disconnected. Your doctor will advise you to avoid making sudden, jerky arm movements and raising your arms above your head. You will also need to avoid all strenuous activities that involve use of your arms, such as tennis, swimming, bowling, sweeping, raking, scrubbing, vacuum cleaning, and lifting and carrying heavy or bulky objects. When the 8 weeks have passed, the wires will be set, and you can return to your normal routine. Your doctor will examine your pacemaker about 2 weeks after surgery and again about 3 and 6 months after surgery. After that, he or she will continue to examine your pacemaker at regular intervals, at least once a year, to help ensure that it is functioning properly. The doctor can replace the battery in a minor surgical procedure. Pacemakers can remain implanted for 8 to 10 years before the battery needs to be replaced. Interference from microwave ovens, high-voltage equipment, airport security devices, and radar are no longer problems with newer pacemakers, although their functioning still can be disrupted by magnetic resonance imaging (MRI) and diathermy (a physical therapy technique used to bring heat to muscles). Your doctor can tell you which devices and situations you need to avoid. An implantable defibrillator may be used to treat ventricular fibrillation—a dangerously rapid, uncoordinated heartbeat that arises in the ventricles, the heart's pumping chambers, and prevents the heart from pumping an adequate amount of blood to the tissues. Uncontrolled ventricular fibrillation is a major cause of sudden death. The procedure to implant a defibrillator is similar to the procedure for implanting a pacemaker. Two electrodes that monitor the electrical activity of the heart are inserted like pacemaker wires or attached to the surface of the heart and connected by fine wires to a small, battery-operated power source. These electrodes can supply an electrical impulse from the power source whenever the heart beats too rapidly, restoring the heartbeat to normal. The defibrillator's battery-operated power source is implanted in a pocket created by the surgeon under the skin of your abdomen. You will be hospitalized for 1 or 2 days after the procedure, and you may have to wear a portable Holter monitor for 24 hours after surgery to monitor the electrical activity of your heart. Recovery at home will take about 6 to 8 weeks. The same precautions and restrictions that apply to pacemakers apply to implantable defibrillators. You cannot drive a car or operate heavy machinery if you have an implanted defibrillator, because there is a risk of briefly losing consciousness when it sends an electrical impulse to your heart. Some serious arrhythmias are treated surgically. For example, catheter ablation (delivery of radiofrequency energy through a catheter inserted through an artery into the heart) often is used to destroy or remove the tiny area in the heart that is causing an arrhythmia. Coronary artery bypass surgery (see page 216) and coronary angioplasty (see page 216) are used to control arrhythmias caused by coronary artery disease (see page 204).